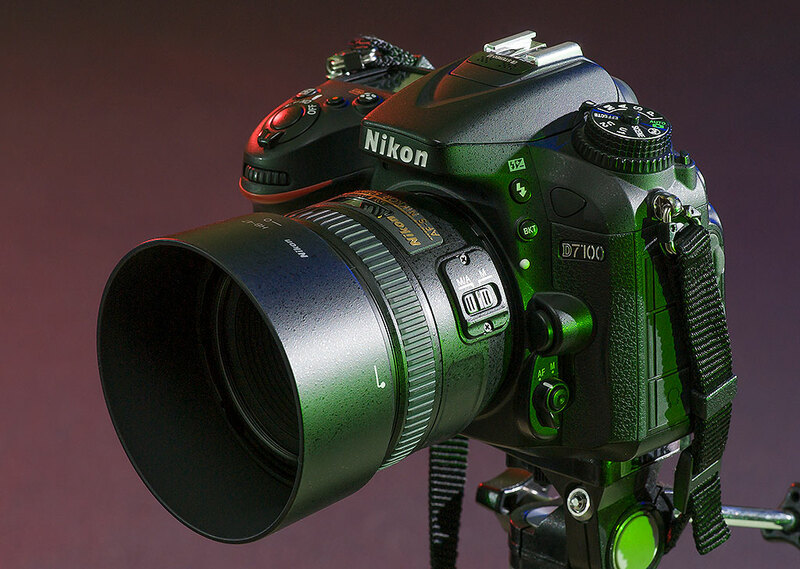 Our new AF-S Nikkor 50mm F/1.4G is pictured mounted on my Nikon D7100. It seems that every January my wife Abby and I log in to our credit card rewards site to see how many points we have accumulated in the past year. She then picks out a couple of items and gives the rest of the points to me. This year I was able to purchase a new iPad Pro, as well as the topic of this post, the AF-S Nikkor 50mm f/1.4G. I consider this lens to belong to both of us, which is true for everything we own, really. Max looks up at me from Abby’s lap is this image made with our new 50mm f/1.4 lens set at f/1.8 and about 1/125th of a second at ISO 800. As you can see, it is tack sharp, and the background melts away gracefully. 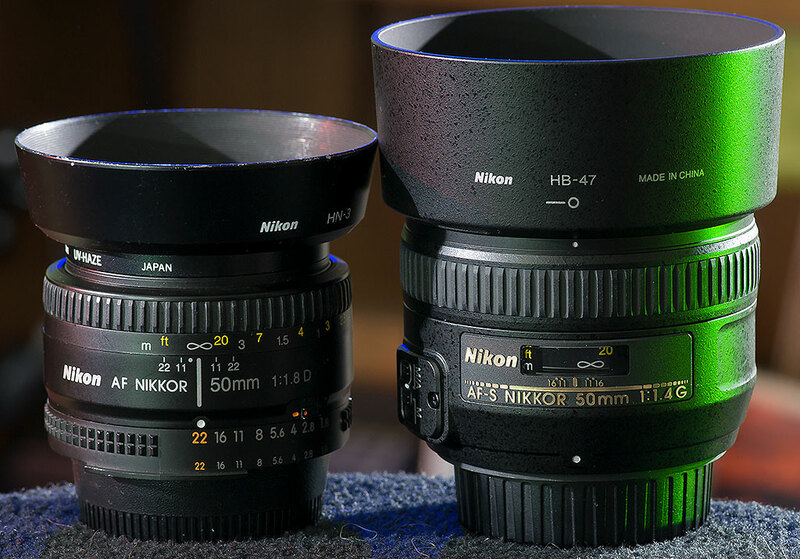 The AF Nikkor f/1.8D, left, sits next to its replacement, the larger and more modern AF-S Nikkor 50mm f/1.4G. I know what you’re going to say: Richard, don’t you always recommend the much cheaper 50mm f/1.8? Yes I do, and the truth is that I would never have paid cash for the f/1.4, but with a large number of accumulated rewards points made it easier to spring for its luxury. And the more I thought about it, the more I decided I wanted to have at least one f/1.4 lens in my bag. Considerable larger than the f/1.8 it replaces, this lens comes with a large plastic bayonet-mounted hood. Mounted on my D7100, it makes a handsome, well-balanced package. 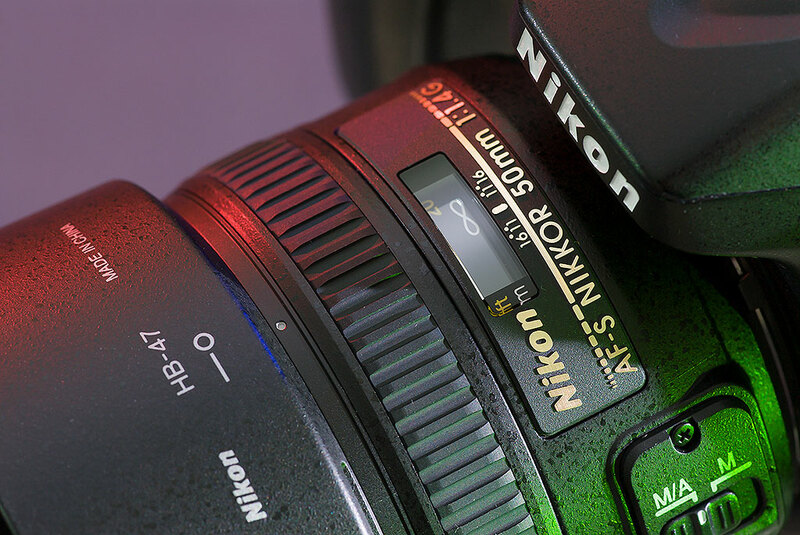 The 50mm f/1.4 is a smart-looking lens, seen here mounted on my Nikon D7100. 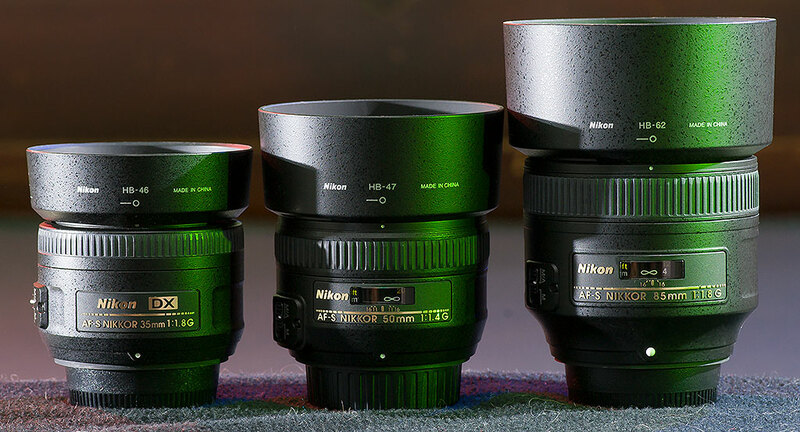 From left to right are my next-generation large-aperture lenses, the AF-S DX Nikkor 35mm f/1.8, the AF-S Nikkor 50mm f/1.4G, and the AF-S Nikkor 85mm f1.8G. Though there was nothing wrong with my old 50mm f/1.8, it is missing a feature common to the new Nikkors, AF-S, which uses motors inside the lens to move the focussing elements. This benefit is twofold, with focus being faster and internal, as well as allowing the photographer to turn the focus ring any time to focus manually. Finally, we usually own and shoot with large-aperture lenses at their largest apertures, since we didn’t pay a premium price to shoot them at f/11, which even the cheapest 18-55mm kits lens does with ease. 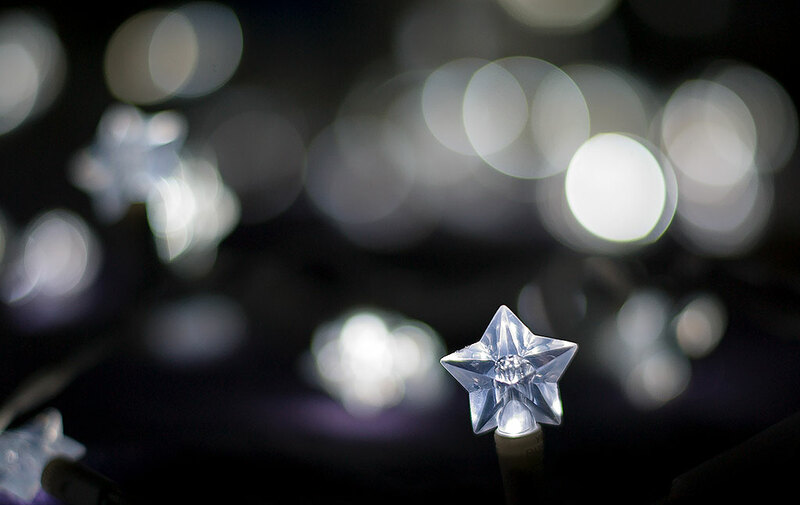 One of my goals with the lens will be to push the limits selective focus at very large apertures. I’ve only shot a few frames with it wide open (f/1.4), but early tests indicate what I expected: depth of field of just a few millimeters, powerful selective focus, and pleasing bokeh. I am excited to have this tool in my toolbox. After Christmas I kept these lights out of the decoration boxes in the rafters for just this purpose: experimenting with very large apertures. As you can see, the AF-S Nikkor 50mm f/1.4 exhibits acceptable sharpness in the focus area, and beautiful out-of-focus regions. I look forward to experimenting with it more, then putting this lens into service for things like weddings, night photography, and portraits. If nothing else, this post makes me want to switch to a reward-points credit card. 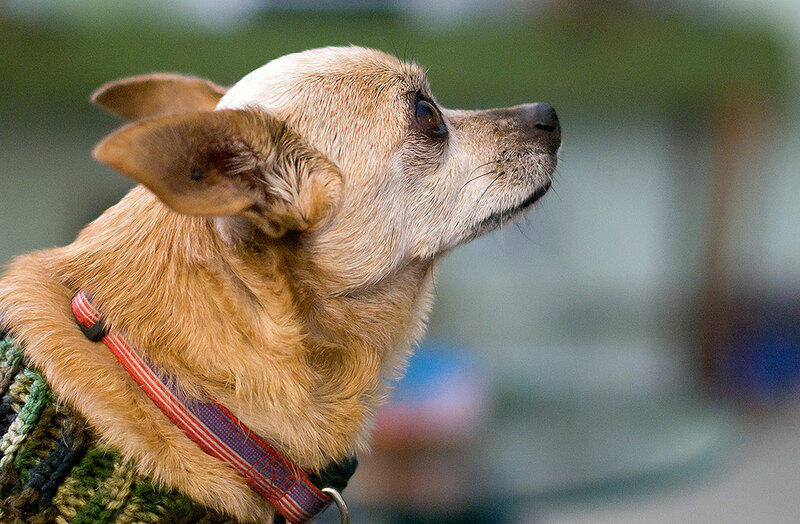 Great piece, and while I enjoy my own 50mm f/1.8, I find I don’t use it as much as the 35mm f/1.8. To expand on my earlier comment (interruptions! ), I find the 35mm to be a little more versatile than the 50mm, though I wouldn’t be without either lens. This past weekend, the 50 came in very handy at a wedding held in a small-ish church with some tight corners and low lighting. It was just the right lens at just the right time, which kind of makes it perfect!